Carol Bishop Estate Sales Personal Property Liquidation. An estate sale is held in the home and involves the sale of any personal property. This could include cars, boats, furniture, china, books, clothes, jewelry and everyday items. (don’t throw anything away!) When faced with the challenge of moving, retiring, liquidating or downsizing an estate, it can be an overwhelming and stressful experience. As experienced professionals, we have the knowledge and resources to minimize the stress and maximize the dollar return. Licensed, bonded, insured and have established trust in the community since 2001. We have a large data base of customers, collectors, dealers, appraisers and experts in the personal property field. Our employees are caring, discreet and knowledgeable, bringing a wide range of talent and skill to the job at hand ---getting you as much money as possible---always with enthusiasm, integrity and professionalism. Many years ago we were in charge of the estate of our friend and next-door neighbor and needed to have an estate sale after his passing. We interviewed several estate-sale services and choose Carol Bishop. The sale went very well and we were impressed by how the conducted the smoothly running event. They spent several days preparing the items to be sold cleaning and photographing, arranging and organizing. Afterwards she gave us a clear accounting of what was sold and for how much. She even helped us clear out the items that weren't sold. From start to finish things were professionally handled and we were very pleased. Since then, we attended many of Carol Bishop's estate sales and found fun, interesting, and unique items for our own home. On occasion we have gone to sales run by other services and have been disappointed. These sales often lacked price tags on items, weren't organized or hadn't cleaned or cleared things out. Sometimes it was difficult to figure out who was running the sale so we could ask questions. 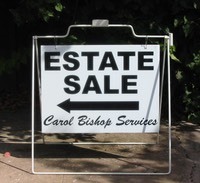 We have no problem recommending Carol Bishop's Estate Sales company to other and have even done so with to our friends. Hi Jill: Thanks for the inventory, and we're pleased with the amount of the proceeds. I'm surprised at some of the things that did sell, and didn't. But then I know absolutely nothing about estate sales. I keep hearing from friends and neighbors who stopped by. My, but people are curious creatures! Thank you for all of your hard work. We would certainly recommend your company. Sometimes it's the little things that move you to tears, or perhaps that those little things represent something much bigger in this ever evolving thing called life. After a close family member falling ill, I was put in the sole unexpected position of selling a home, holding an estate sale, moving, and working full time, all over the course of about 2 months. The estate sale was orchestrated, including several week of full time preparation beforehand, by a group of amazingly patient, sweet, genuine, & understanding women, especially as I and my 2 furry boys were still living in the home. For those of you who've never had an estate sale...it can be extraordinarily emotional, particularly if the items being sold are connected to you...much of everything there (including the home) had been in my family for decades. It's like losing pieces of your past. But change is imminent for all of us. Thousands of items moved out of my life, my history, and became part of someone else's. And then...there was the Beluga whale...a hideous clay sculpture I made in High School. Of course it didn't sell lol, not even for $3, but I didn't have the heart to throw it away. After the estate sale ended, Jill (one of the amazing crew at Carol Bishop Estate Sale Services) told me she wanted to buy the whale. I laughed and said absolutely not, im not taking your $3. We all chit chatted for awhile, laughed, we hugged, and the went on their way. The next morning I went into the kitchen and there was $3 with a note taped atop the coffee maker. My eyes welled with tears as I read the note:"It was a whale of a time." Jill had purchased the whale, and later sent me a photo of it on a shelf at her home. In the deep sadness surrounding those months, I cried extensively and frequently, sometimes exhaustively, but that was the 1st time tears were shed in gratitude, for a simple act of kindness.